For the inside layer I used Berroco’s Ultra Alpaca – lighter weight and softer than the un-spun. The Village Knitters has a wide color selection. For the outside layer I used the Un-Spun Icelandic wool that Schoolhouse Press supplies in the United States – here is a link to their website – Un-spun Icelandic wool from Schoolhouse Press I used two wheels of it in 2 different colors to have fun with the Dancing Ladies pattern. I believe Knitterly carries just a few colors of Bulky 2 Strand Pencil Roving, a sustainably produced un-spun wool by the Imperial Stock Ranch in Shaniko, Oregon – here is a link to their website – Buy Imperial Stock Ranch Yarn & Fiber | Imperial Yarn They have a wonderful range of colors available through their online shop. I will also check to see if this might be something Sandie would like to carry in her shop. Keep you posted. If these fibers do not appeal to you – basically, you are looking at a yarn that produces an approximate stitch gauge of 5 stitches per inch – but as you now know… we know how to adjust THAT! if there is a fiber that doesn’t fit into that (Pill)box! Enjoy making your decisions and don’t forget to breath! 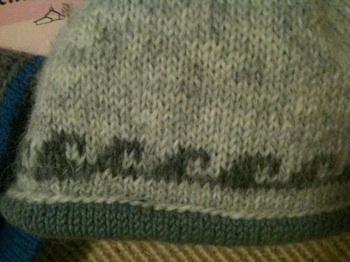 The row numbers are upside-down because I wanted to knit it with the figure right-side up. 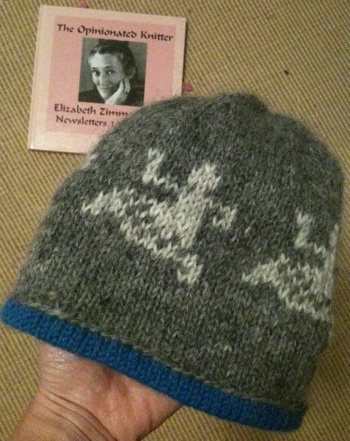 And a hat brim where I used the Wave pattern charted in Donna Druchunas book Ethnic Knitting: Discovery: The Netherlands, Denmark, Norway, and The Andes. The Wave pattern on another double layered hat. And let me know if you have any particular pattern design interests, as always, happy to explore more potential ideas! P.S. A note about the double layer – due to the insulation properties of the layer of air between the two layers of fabric you experience a more consistent temperature on your head. 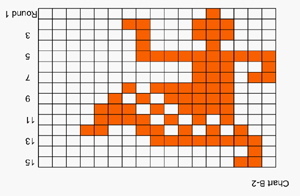 I love the dancing ladies chart! I will try to incorporate it into something I will be knitting for some kids. I think they will like, it too.